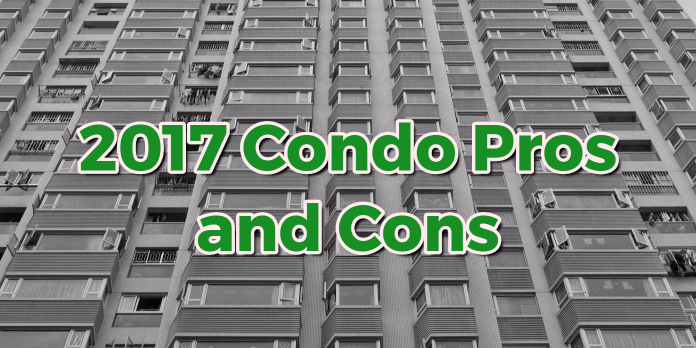 2017 Condo Pros and Cons: Is It Right For Me? If you are buying your first home and are considering a condo, this article on 2017 Condo Pros and Cons is just the thing you need to ensure you are making the proper home purchase. You want to make sure that a condo is truly right for you and that you know everything both good and bad for these properties. Maintenance Managed: One of the first pros for the 2017 Condo Pros and Cons discussion is that of maintenance being managed. What I mean by this is you do not need to worry about a lot of the maintenance you’d be responsible for with a home such as cutting your grass, shoveling your snow, and cleaning out gutters. This is especially attractive for first-time home buyers as well as people that are ready for retirement. If you are looking for a home that doesn’t require much work at all outside the home, then a condo is your go to purchase. Ability For Travel: Another positive for purchasing a condo is the ability for you to travel by simply packing up and leaving as you wish. Since you know that most of your maintenance is being taken care of, all you need to do is keep the bills paid and you are free to come and go as you please. This is especially why the retired snowbirds have condos in warmer climates so they can spend nicer months with family and the winter months away. Price and Insurance: For the most part, condos offer a lower price point which will make it easier for a borrower to get approved by a lender for the loan. In addition to this, you are also almost for surely going to have a lower insurance cost since you only need to insure what is inside the condo. The association is in charge of insuring and maintenance to the outside of the condo. HOA Regulations: If there is one con to begin with when going over 2017 Condo Pros and Cons it is HOA Regulations that you will be faced with as a home owner in the complex or community. If you are used to living in a single family home and doing your own thing, this might take getting used to. The association will make the rules and could possibly prevent you from doing some upgrades if it doesn’t fit in their scope of what they want the community to be. HOA Fees: If you aren’t a fan of HOA Regulations, then you won’t be happy knowing that on a monthly basis you need to pay an HOA Fee. Granted, this fee includes the fees in order to obtain the up-keep of the community, insurance, maintenance, and sometimes utilities. These HOA Fees can surpass the $500 mark per month. If there is ever emergency maintenance needed in the community or building, all home owners may be required to pay what is called a special assessment in order to facilitate the repairs. Selling Troubles: A con you might not even think of in the 2017 Condo Pros and Cons is the difficulty in the potential sale of the condo. For example, associations can limit who you sell your condo to or even the type of loan the potential buyer can have. As you can see, associations can make it even more difficult for you to get out of the property when you’d like to. As you can see, we have gone over 2017 Condo Pros and Cons. Now condos aren’t for everybody and normally attract a certain type of buyer with a specific lifestyle. If you are someone who is interested in purchasing a condo, you need to reach out to us at Loan Consultants ASAP at 888-900-1020 or email us at contact@loanconsultants.org. We look forward getting to know you and ensuring you get the home of your dreams for the lowest possible mortgage payment. We are available days, nights, weekends, and holidays in order to offer you the best service!